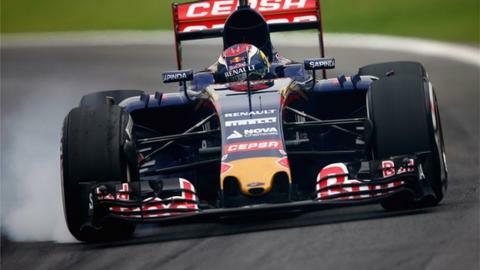 Max Verstappen has been one of the stars of the Formula 1 season. Twelve months ago, he had just finished his first season in car racing and had just driven a grand prix car for the first time. At 17, he was being put forward as a reason to bring in a minimum age limit for drivers entering F1. There were question marks about him, and the morality and wisdom of having such a young driver with such limited experience. A year on from that, those questions marks are long gone, and Dutchman Verstappen is regarded as the revelation of the season - and his performances have put more focus on youth coming through. Beyond that, people are talking about him as a future world champion. There have been a couple of defining characteristics about all those moves. Firstly, they have all been very close, but none of them went wrong. Verstappen has excellent spatial awareness; a very good feel for the extremities of his car and his rivals. And secondly, they are all under control - there are no locked wheels or overshot corners, despite being very much on the limit. He has great sensitivity for how deep he can brake into a corner and where the limit is, which I have not seen very often before. It's impossible to make a definitive judgment on Verstappen's pace, because the only person we can directly compare him to is his team-mate Carlos Sainz, who is also a rookie. However, what we can say is that, in his rookie year, Verstappen has qualified 11 times in the top 10, including sixth in his second race. And he has finished in the top 10 in five of the last six races. It's also worth mentioning in that context that the Toro Rosso has not developed as much through the year as some of the cars around it. Its qualifying margin to Mercedes has stayed basically the same, whereas Force India, for example, have moved forward. Another stand-out aspect of Verstappen's season has been the lack of ups and downs, which you expect of any driver, and especially one in his first season. What about the non-physical stuff? Beyond his basic ability, Verstappen seems to be mentally very tough as well. You can see that in the way he deals with his new-found celebrity - and the way earlier this season he made his feelings known about his belief that Sainz was getting more of the rub of the green on strategies. Intentionally or not, if anything Toro Rosso's focus has now gone in the other direction, towards Verstappen. His mental strength was also seen when he refused to accede to a team order to let Sainz by in Singapore. If that sounds tough, it is. But it is one of the many character traits that makes the difference between ordinary drivers and special ones. None of the people who have won world championships have done it by being pussycats. Despite that, Verstappen is also quite light-hearted. I ran the circuit on Saturday night in Brazil and at the start of my second lap, Verstappen was standing by his pit board, preparing it for his engineer, who was also running the circuit. That sort of light-hearted, youthful enthusiasm for life is a complete contrast to the hard-nosed ambition we see in the cockpit. Verstappen has made only one major mistake this year, and that was when he crashed into Lotus's Romain Grosjean in Monaco. It was a misjudgement and a step too far - and it was not a good idea not to admit it was his mistake, and to try to blame Grosjean. I'm sure that was partly to do with his self-belief, but also because it was such a surprise. So it was probably a bit of a shock to the system - it was also a huge shunt. Still, he would not be the first driver who was reluctant to admit his mistakes. Michael Schumacher made a career of it. Impressively, though, Verstappen has recovered from it and gone from strength to strength. As the season has gone on, Verstappen has overshadowed team-mate Carlos Sainz - the Dutchman is now 12th in the championship with 49 points and the Spaniard is 15th, with 18. That's a huge gap, but it is not properly representative of their relative performances. Sainz is 21 and has more experience in car racing than Verstappen. I know his dad, the rally legend of the same name, and I have watched young Carlos ever since he came into racing. He has always impressed me and has continued to do so this year. You have to bear in mind that Sainz very nearly did not have a seat in F1 this year. Red Bull had already promoted Verstappen, but the initial idea was that the teenager would be team-mate to Daniil Kvyat at sister team Toro Rosso. It was only when Sebastian Vettel told Red Bull at last year's Japanese Grand Prix that he was moving to Ferrari that a seat opened up for Sainz, when Kvyat was moved up to the senior team to partner Daniel Ricciardo. Even then, it was only after a late test that they decided finally to give the seat to Sainz. Despite that, Sainz was arguably the more impressive in the first half of the season - he out-qualified and out-raced Verstappen most of the time. Undoubtedly, the second half of the season has not been as good for Sainz, but they are still tied nine-all on qualifying and Sainz has the highest qualifying position all year, with fifth in Spain. On pure speed, it favours Verstappen by about 0.15secs if you average out all their laps, but in a team with reliability problems like Toro Rosso I am always reluctant to take that as a definitive comparison as the facts can be distorted too easily. On top of that, Sainz has definitely had the worse run on reliability and has had seven non-finishes, four of them in the mid-season. But Sainz has continued to impress - just look at his race in the USA. He started from the pit lane and despite being stuck on medium tyres on a damp-but-drying track - when the softs would have been more suitable - he still finished seventh. He was every bit as fast as Verstappen and Sainz's performance in Austin was as impressive as his team-mate's fourth place. Sainz also showed great tenacity in racing the next day after the huge shunt he had in practice in Russia. It was his first big accident, and that is always a tester for a driver - there is no certainty they will be unaffected by it. But the next day he was up to seventh place when he had to retire with failed brakes. Sainz is smooth and consistent and makes no mistakes in races, whereas Verstappen has made a couple of high-profile errors. Overall, Sainz may not have produced the box-office excitement of Verstappen, but the performances have been much more impressive than the results are at face value. Next year will be a big test for both. The first year in F1 is a honeymoon period. But next year expectations will be higher for both and the focus will be more intense. The Red Bull driver programme was coming in for criticism a few years ago, but there is no doubt it has now produced some current and potential stars. A couple of years ago, it seemed Sebastian Vettel was the only really top driver it had produced. But now all four of the Red Bull drivers in F1 have come through it, and they all look pretty special. And there is also Sebastien Buemi, still the lead team's reserve driver, who won the World Endurance Championship last year. There is a downside to that, though - Toro Rosso drivers tend to get two years each. But with Kvyat and Ricciardo impressing at Red Bull and both Verstappen and Sainz looking good at Toro Rosso, that is going to give Red Bull some headaches next year. Unless one of them moves elsewhere, there is a logjam there, especially if they want to bring in another new driver. It will be interesting to see how Red Bull handle that.